Dr. Nader Shah Nangahari, a dentist by profession and a passionate cyclist, is currently undertaking — for the second time — a bike tour around the globe. This time accompanied by his son. In 2002, Dr. Nangahari departed on a bike tour to convey a message by the Afghan people – a message of peace, friendship and cooperation among humanity. His first trip, 2002-2003, took him from Afghanistan to Iran, Turkey, Bulgaria, Serbia, Hungary, Austria, the Czech Republic, Germany, Denmark, the United Kingdom, and finally, the United States. Upon his return to Afghanistan, he was awarded the title of hero by the Afghan Government and a medal by the Afghan National Olympic Committee. From 2003 onwards, he visited different regions of Afghanistan to share his vast experience and advocate for the education and empowerment of women. This year, Dr. Nangahari is repeating his successful initiative. 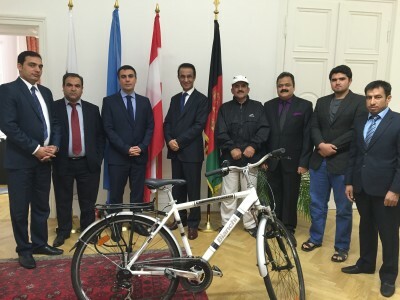 Yesterday, he and his son stopped in Vienna for meetings at the Afghan Embassy and Permanent Mission (second photo), and with Mr. Otto Flum, Vice-President of the Austrian National Olympic Committee (first photo). Also, Wiener Zeitung daily newspaper conducted an interview with Dr. Nangahari. “My country Afghanistan has achieved much progress over the past fourteen years and has become a better place to live for the Afghan people, thanks to the sacrifices of the Afghan people and the generous support by the International Community”, Dr. Nangahari stated during the meeting with Mr. Flum. “However, security still remains a serious challenge for peace and stability in the country. The main purpose of my trip this year is to convey to the International Community that the Afghan people, as a peace-loving people, are tired of war and foreign intervention”, he continued. He concluded by stating, “We are grateful for the assistance provided to us by our international friends and partners. I would like to call on the international community to continue their support for the Afghan people and for peace and stability in the country.” Dr. Nangahari thanked Mr. Flum for the warm welcome and friendly hospitality. Dr. Nangahari’s message is a message of peace and solidarity with the International Community, in the spirit of Olympic solidarity and ideals to live in peace and harmony with each other. 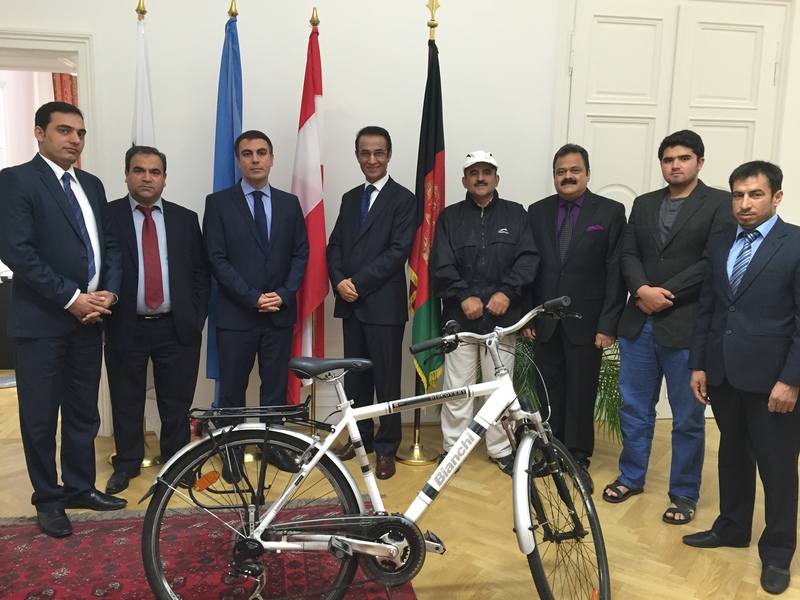 During their stay in Vienna, the two cyclists were guests of the Embassy and Permanent Mission of Afghanistan. Embassy staff accompanied them to the Czech border from where they continued their trip to Prague. The delegation of Afghanistan was invited by the UK Chair of the Security Committee to speak at today’s session of the Security Committee, on border-related issues, in response to presentations made by Sibylle Kapferer, Border Security and International Refugee Protection, UNHCR; Manuchehr Fayzulloev, Head of Border Management Department, Ministry of Foreign Affairs of Tajikistan, Nasimjon Rajabov, representative of the Department of Border Forces of the State Committee for National Security of Tajikistan; Nazira Shozodaeva, Border Management Assistant, OSCE Office in Tajikistan; and Dennis Cosgrove, Head, Border Security and Management Unit, TNTD. Ambassador Erfani highlighted UNHCR’s strong partnership with the Afghan Ministry of Refugees and Repatriation and the importance of the “Solutions Strategy for Afghan Refugees”, addressing the problems of Afghan refugees returning from Iran and Pakistan, via voluntary repatriation programmes, as well as about 600,000 internally displaced people. In response to the presentations made by Mr. Fayzulloev and Mr. Rajabov, the Ambassador pledged continued co-operation between Afghanistan and Tajikistan in addressing transnational threats. He recalled that in October 2013, the two countries have signed three agreements of co-operation, on de-mining, cross-border co-operation and the insurance sector. At a meeting in Dushanbe, on September 12, at the margins of the 13th Annual Summit of Heads of State of the Shanghai Cooperation Organisation, Tajik President Rahmon and Afghan President Karzai discussed implementation of joint programs, matters related to transit and trade, as well as bilateral co-operation in the energy sphere. “Both presidents expressed confidence toward improved peace and stability along the shared border and a successful combat against trafficking of illicit drugs, precursors, arms and weapons, as well as disruption of terrorist activities which pose serious threats not only to our two countries but to the whole region and beyond”, Ambassador Erfani noted. “Ms. Shozodaeva and Mr. Cosgrove gave us an insightful look into their work and we appreciate both the important work of the OSCE Office in Tajikistan and the Border Security and Management Unit of OSCE’s Transnational Threats Department”, the Ambassador said when replying to their excellent presentations. The Border Management Staff College (BMSC) in Dushanbe opened in May 2009 as a centre of excellence and plays a crucial role in tackling cross-border threats. A number of Afghan senior border officials have already benefitted from transfer of knowledge and capacity building programs at the college. Before closing, Mr. Ambassador made mention of today’s International Day of Democracy, declared by the UN General Assembly in 2007. “We are reminded to uphold the values, norms and principles of the United Nations Charter. Afghanistan is a young democracy and reiterates its commitment to the Charter”, Ambassador Erfani said. Finally, Mr. Ambassador thanked once again all speakers for your inspiring presentations and the UK Chairperson of the Security Committee for the opportunity to speak. 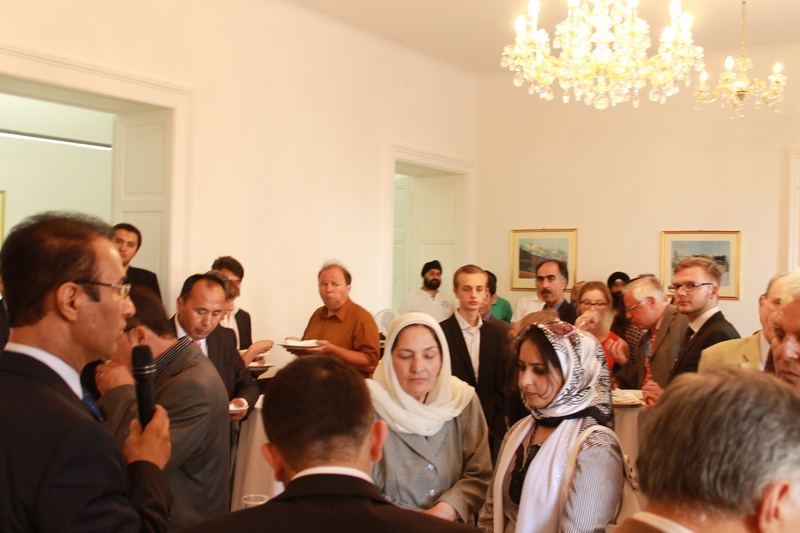 The Embassy and Permanent Mission of Afghanistan in Vienna marked the end of the Ramadan period with an Eid celebration on the Embassy premises. A large group of fellow Afghans from the community here in Austria joined the celebration at the Embassy, in addition to local Austrian officials and some journalists. Ambassador Erfani and Deputy Chief of Mission, Minister-Counselor Abdul Wahab Arian welcomed all guests before the guest of honor, author Dr. Heide Amato-Koller opened the buffet of a delicious selection of Afghan treats. Ambassador Erfani welcomed the guests to the event and he expressed his wishes for sustainable peace and prosperity in Afghanistan. He asked the Afghan community in Vienna to continue to focus on educating their children, as the new promising generation of Afghanistan. The Permanent Mission prepared Afghan dishes for the invited guests. After the meal concluded, H.E. Ambassador Ayoob Erfani took the floor, thanking all guests for their attendance, wishing them all the best and highlighting the significance of Eid celebrations for unity, solidarity and peace in the country and beyond, in particular in light of the 2014 Transition and upcoming Decade of Transformation (2015-2024). Additionally, Ambassador Erfani noted the importance on togetherness in the Afghan community in Austria and encouraged attendees to remain in close contact with the Embassy for future endeavours. Representatives of the Afghan community took the floor and appreciated the active involvement and engagement of the Embassy with the Afghan community in Austria. 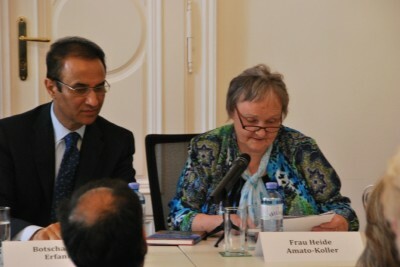 The Embassy of Afghanistan in Vienna today hosted a book presentation with author Heide Amato-Koller who presented and read passages from her book detailing the period of her childhood which she spent in Kabul, titled “Kindheit in Kabul – Meine Jahre in Afghanistan 1950 – 1955”. In his welcoming remarks, H.E. Ambassador Erfani commented that, Mrs. Amato-Koller’s book has been published at an important time of transition and transformation for Afghanistan. As young Afghans work for progress, democracy, and an open society, it is important to view the future in the light of the past. Ambassador Erfani opened the event with introductory remarks, after which Minister-Counselor Mr. Wahab Arian introduced Mrs. Amato-Koller and her ghostwriter Mr. Mario Jandrokovic. Ms Koller spoke of her love of the country and the wonderful friendship she made with an Afghan girl, who was her neighbor in Kabul. She also spoke of the intricacies of Afghan society and different cultural experiences she made whilst in Kabul. 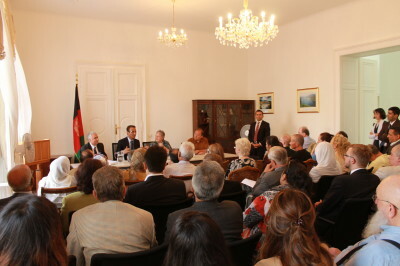 Attended by a number of local officials, journalists and members of the Afghan community, the event included a reading of passages from her book and a brief Q&A session, followed by a reception in the Embassy with Afghan specialties. The Permanent Mission of Afghanistan actively participated in the OSCE’s Annual Security Review Conference (ASRC), held from 24 to 26 June. H.E. Ambassador Ayoob Erfani was joined by Ms. Shukria Barakzai MP and Mr. Safiullah Muslim MP to lead a high-level Afghan delegation to the Conference. Ms. Barakzai presented an insightful keynote address during today’s working session IV on “Supporting stability in the OSCE area during the ongoing transitions in Afghanistan”, sharing her experience and perception as a senior parliamentarian of the Afghan Lower House (Wolesi Jirga) and deserving women’s rights activist. Mr. James Appathurai, NATO Deputy Assistant Secretary General for Political Affairs and Security Policy and NATO Secretary General’s Special Representative for the Caucasus and Central Asia, also presented a keynote speech during this working session. Furthermore, a representative of the OSCE’s Office for Democratic Institutions and Human Rights (ODIHR) updated delegates on the work of the ODIHR Election Support Team during the second round of Presidential Elections in Afghanistan. On the second day of the conference, Mr. Muslim made an intervention during working session I on “Early warning, conflict prevention, crisis management, conflict resolution and post-conflict rehabilitation: Lessons learned and the way ahead”. The Afghan delegation also delivered presentations in working breakfasts on Afghanistan, organized by the OSCE’s Gender Section and the Delegation of Mongolia. Additionally, meetings were held with the Secretary General of the OSCE, H.E. Lamberto Zannier, and with the head of the United States delegation to the ASRC, Deputy Assistant Secretary of State, Mr. Brent Hartley. I would like to join the previous speakers to strongly welcome Ambassador Markus Muller, Head of OSCE office in Tajikistan back to the Permanent Council and thank him for his annual report, where. We highly appreciate the continued cooperation of the OSCE in Tajikistan to contribute in the capacity building in Afghanistan, especially when it comes to the training and exchange of knowledge for border staff in Tajikistan and Afghanistan. The knowledge and skills that our border personnel are receiving from these kinds of training operations at the Border Management Staff College in Dushanbe, including Afghan women which we have seen on the slide, will help us combat the challenges which stand in the way of our journey to the decade of transformation. I am positive that the efforts led by the OSCE office in Tajikistan have been successful and I strongly hope that after an evaluation the projects will be extended. On this note I would also like to thank Ambassador Müller and his team for helping facilitate the exchange of experience and best practices in the area of mine clearance with Afghanistan. Afghanistan as a long-term victim land mines, has made enormous progress in cleaning the landscape of millions of land mines, but millions more are still embedded across the country. Land-mines can be cleared and we have the human capacity to do so, however we still require funding, resources and equipment . Thus, we highly appreciate the help that we are receiving from the OSCE office in this field and are certain this will continue to be a productive relationship. The longstanding, close, brotherly relationship between Afghanistan and Tajikistan, two countries which share almost all common values, dates back to the friendship treaty of 1750. As we have heard from Ambassador Müller, the relationship between Tajikistan and Afghanistan continues to develop as we further our levels of co-operation, in the areas of combatting Organized crime, to logistical enhancements in infrastructure, energy and transportation. Tajikistan and Afghanistan share a 1300km border, and thus cooperation among our border officials is essential. Of this border, much of it is marked by the Panj river, and we are proud that we have been able to rebuild transportation links between our nations. As Ambassador Müller has stated in his report, we will soon be able to open the 5th bridge in Shurobod district connecting our nations. This is another milestone in the cooperation between Tajikistan and Afghanistan and a testimony of commitment by both countries to the goal of regional connectivity . Recent unfortunate circumstances have also shown the need for further cooperation between Tajikistan and Afghanistan in the area of environmental issues. The mudslides in Badakshan show that Tajikistan and Afghanistan are affected by similar environmental problems. Therefore, we welcome Ambassador Müller’s report about the Tajik-Afghan workshop to discuss environmental issues, such as land degradation and deforestation. Once again I would like to express my sincere appreciation of the support that the OSCE has been offering to our friendly neighbor, Tajikistan, and to the Government of Afghanistan. We hope to see an extension of this OSCE facilitated cooperation and combined workshops where both nations will be able to profit greatly from this. We are very grateful that Tajikistan has taken so many steps to support their neighbors in Afghanistan and wish them every prosperity for the future. On behalf of Afghanistan I would like to reiterate our strong commitment to join our efforts with our neighbors in OSCE participating countries to address all remaining challenges and use every opportunities which remain essential for the security, stability and development of our region and beyond and we highly value OSCE’s contribution and supports to this end. Concluding, we appreciate your efforts Ambassador Muller and we wish you and your good team every success. We join our American friends in observing Memorial Day, honoring the brave American women and men who made the ultimate sacrifice to protect our countries and freedom. They volunteered and answered the call to service for us to be free of harm and full of democratic opportunities. Afghanistan’s achievements over the past decade would not have been possible without their strong support. Their selfless commitment will never be forgotten by the people and government of Afghanistan. God bless America, God bless Afghanistan. H.E. Ambassador Ayoob Erfani, Permanent Rep to the UN and Resident Representative of Afghanistan to the International Atomic Energy Agency (IAEA), is heading the delegation of Afghanistan to the IAEA’s 57th annual regular session of the General Conference, held in Vienna from 16 to 20 September, 2013. In his address, Mr. Ambassador Erfani stressed the importance of the IAEA General Conference as both key international forum to reflect on today’s challenges, and venue for dialogue on secure and peaceful uses of nuclear applications and technologies, and he added that “Afghanistan, on the basis of its policy of multilateralism through strong regional and international cooperation, is ready to do its part for the success of the IAEA mandate”. Furthermore, Mr. Ambassador outlined future priorities of the Government of Afghanistan in its cooperation with the Agency, ranging from technical cooperation, in particular in the area of human health, capacity-building, and nuclear and isotopic applications in the fields of agriculture and water resource management. Also, Mr. Ambassador emphasized that Afghanistan will remain a strong advocate of strengthened nuclear safety regimes: “Potential trans-boundary impacts of nuclear accidents remind us of the universal nature of the issue of nuclear safety.” At the same time, Afghanistan recognizes the danger of nuclear or similar radioactive materials being used in terrorist attacks and therefore supports all measures geared at reinforced global nuclear security. Ambassador Erfani also noted that robust safeguards and verification mechanisms are a prerequisite for nuclear disarmament and invites all concerned IAEA Member States to “take further steps towards nuclear disarmament”, while pledging Afghanistan’s continued commitment towards regional and international cooperation. In closing, Mr. Ambassador Erfani extended his appreciation to all those IAEA Member States which have generously contributed to the technical cooperation fund, thereby enabling implementation of vital projects in Afghanistan. Vienna, 11 September 2013: H.E. Jean Asselborn, Deputy Prime Minister and Minister of Foreign Affairs of Luxembourg briefed the OSCE’s Forum for Security Co-operation (FSC) at the opening session of Luxembourg’s chairmanship of the FSC about the agenda for the upcoming three months, among them the holding of two security dialogue sessions where the transition and the post-2014 situation in Afghanistan will be high on the agenda. Mr. Asselborn emphasized the importance of Afghanistan in OSCE´s engagement for the security and stability in the region. Dear colleagues, dear participant ladies and gentleman, good morning. It is a pleasure for me to participate in today’s annual session of field experts from UNOD’s terrorism prevention branch, to share with you our experiences from Afghanistan in dealing with counter-terrorism and the lessons we have drawn from this. Today, I will share with you the experiences drawn from Afghanistan, which is the prime victim of and an active partner against international terrorism as a global challenge. I will also talk about our successes, achievements, ongoing progress, remaining challenges and I will be happy to have an interactive discussion with you on this subject. To begin with, I would like to express my gratitude to UNODC for the assistance it has given Afghanistan, and I appreciate the continued efforts and partnership of UNODC with Afghanistan in this field. Terrorism and extremism did not exist in Afghanistan two decades ago, however during the period of war and inner turmoil in the country, terrorist organizations and radical elements moved to the country and Afghanistan, which was once a stable and peaceful nation, became a prime target and victim of terrorism, which had detrimental consequences for the country’s political and security institutions, society and economy. Each and every day, Afghan men, women and children wake up with the fear that another brutal act of terror will occur, killing or maiming another family member or fellow citizen. Through suicide and roadside bombings, attacks on our clinics and schools, markets places and mosques, terror and violence continue to deprive the Afghan people from their rights for a peaceful life. Since the fall of the Taliban in 2001 Afghanistan has come a long way, from being a lawless country, an epicenter of international terrorism and a source of regional instability. Afghanistan has begun re-building its national institutions, has established the foundations of democratic society and moved to a market economy, and has adopted a constitution that protects the rights of all its citizens, especially those of women and children. These achievements were made through the unprecedented commitment of the international community, with the central coordinating role of the United Nations. Yet, many challenges remain – the greatest being to fight terrorism and to establish lasting peace across the whole country, and to free Afghans from decades of violence and conflict. Afghanistan is firmly committed to defeating terrorism in all its forms and manifestations, and has, in this regard, spared no effort at the national, regional and international levels. Over the past 12 years since the fall of Taliban, together with our international partners, we have significantly weakened the overall capabilities of terrorist networks. As a result of our counter-terrorism efforts, a considerable number of terrorists have been curtailed in their brutal efforts, and captured, while others are being pursued. Our state institutions have thwarted a significant number of terrorist plots across the country. Consistent with the process of Transition, the Afghan national army and police today are assuming the primary role in all security activities across 90% of Afghanistan, including counter-terrorism operations. Our counter-terrorism policies are a key part of our national security strategy. To that effect, we have further strengthened our counter-terrorism legal framework. Afghanistan is party to all international conventions, protocols and instruments concerning terrorism, and we have adopted a multitude of national laws to combat terrorism and other forms of organized crime. These include the Law on Combating the Financing of Terrorism; the Law on Combating Terrorist Offences; and the Law on Combating Money Laundering. Afghanistan continues close collaboration with a wide range of relevant actors, comprising the counter-terrorism implementation task force. We encourage States which are using terrorism as a foreign policy instrument to desist from doing so and join the international community to fight this challenge. We would like the UNODC to further enhance its efforts in addressing terrorism. We are working closely with the three counter-terrorism committees of the Security Council: the 1373, Committee’ the 1267 Committee and the 1540 Committee. In this regard, we have submitted relevant national reports on implementation, the most recent of which was our 2nd report to the 1540 Committee. A successful counter-terrorism strategy needs a comprehensive approach, including economic, security and political aspects. Such an approach requires sincere cooperation among all States, in particular in the region surrounding Afghanistan. Afghanistan is now in an absolutely crucial phase. The process of transitioning security responsibilities to Afghan National Security Forces is reaching its final stages. As I speak, the security for over 90 percent of the Afghan population is led by Afghan Security Forces. Afghanistan’s national security forces amount to 350,000 soldiers, and they will do their best to defend Afghanistan against any internal and external threats. From our perspective, transition is the beginning of a new era of equitable partnership between a sovereign Afghanistan and its partners in the international community during the decade of transformation and beyond. Alongside this security transition, the peace and reconciliation process is a national priority, based on the conviction that dialogue is the most practical means for ending the conflict that plagues our country. The government of Afghanistan is strongly committed to an Afghan led and Afghan owned peace process. This includes all Afghans who are ready to renounce violence, denounce terrorism, accept the constitution, and respect human rights, especially those of women and children. “Without the active participation of Afghan women, which constitute more than 50% of Afghanistan’s population, there will not be a stable, just and prosperous Afghanistan”. The upcoming 2014 presidential elections will be a milestone in Afghanistan’s democratization process, and the government is doing its upmost to guarantee a free and fair election, and ensure a successful transition to a decade of transformation, which is against the will of terrorist elements in our region. We all must keep in our minds that Afghanistan as a traditional moderate society, that strongly stands against all forms of terrorism and extremism, urgently needs a peaceful life and the international community must remain committed in their support for a peaceful and stable Afghanistan. Terrorist networks and ideological centers are not present in Afghan towns and villages, they operate primarily from their centers and sanctuaries based outside Afghanistan. As a country that has been at the forefront in the fight against terrorism, Afghanistan has suffered immensely in terms of human and material loss. A significantly high number of Afghans, including civilians, tribal and religious figures, law-enforcement personnel and government officials have lost their lives as a result of terrorism. Nevertheless, such attacks will not deter our commitment to achieving lasting peace and security. We are firmly committed to making sure that the sacrifices made along the way will not go in vain. We, in Afghanistan, will remain as resolute as ever in our partnership with the international community to fight against terrorism, and secure a better life for our future generation.